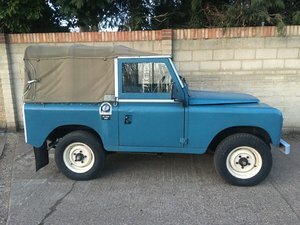 Will be supplied with 12 months MOT. Petrol 2286cc.  Free Wheeling Hubs. Bumperettes Front & Rear. 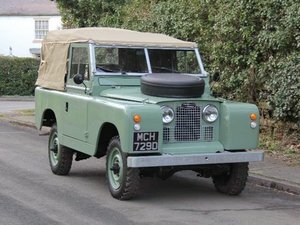 This petrol lightweight is presented in the original Drab Olive colour, and is a less complicated 12 volt variant. 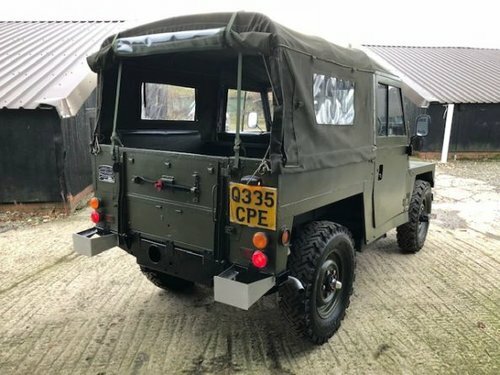 It currently resides on a "Q" plate, which, on release from the military in 1984, was a common designation - some vehicles were assigned an age related plate if the information on manufacture date was easily accessible by the military, some were given the release date plate (so this one might have come out with a 1984 "A"plate) and some, as in this case, were assigned a "Q". 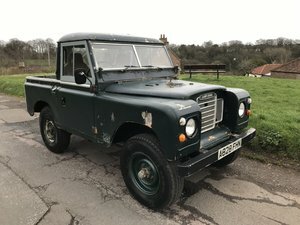 This makes it quite an interesting vehicle - from looking at the data on this one, it is a 1972 - 1980 manufacture date, home market RHD. Should further information be needed, a heritage certificate could be purchased to provide clarity on this. 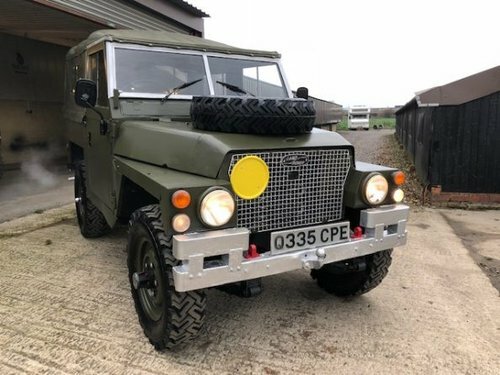 From what we can see (there's a big badge on the inside of the drivers door which has survived due to the later fitment of a now removed door card), it served in the Royal Intelligence Corps, whose motto was "Knowledge Gives Strength To The Arm". 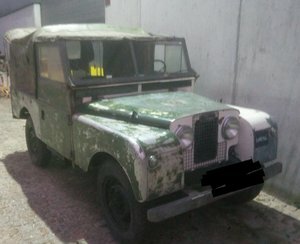 Its military number, 22 HF 73 is fully legible, as are the vin plates which all cross match with the paperwork, so it would be both easy, and very interesting to see where this nice lightweight served - the Corps carried out intelligence work all around The World during The Cold War, and in Ireland. 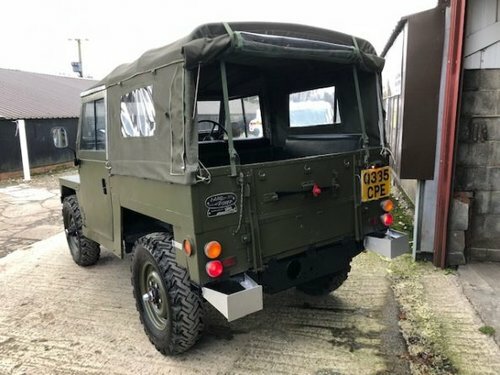 This lightweight has circa 82,000 miles on the clock, that we would have no reason to distrust, as previous MOTs show a gradual increase in mileage, and lightweights had a habit of never doing too much either in the forces, or later, in enthusiast civilian hands - this makes them much "tighter" and nicer to drive than parallel civilian models, and this one is no exception. 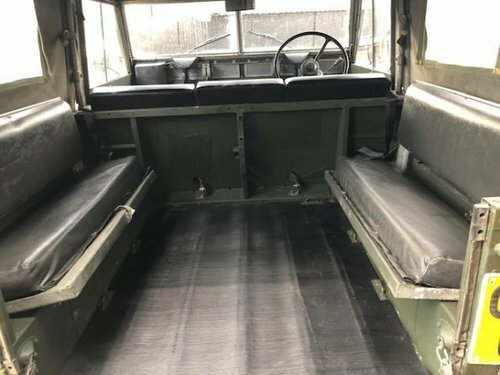 On the inside there are three front seats (a benefit of the 12v machine), and to the rear there are twin bench seats, which, coupled with the recent canvas with side windows, mean you can take the whole family for a jaunt! 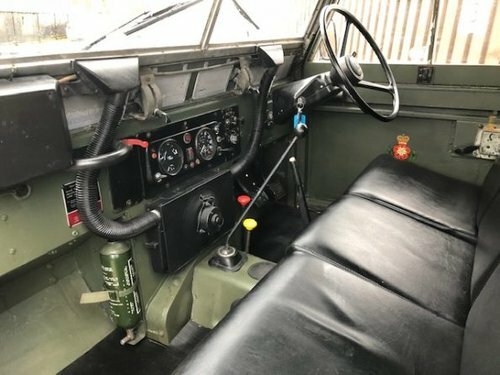 In the front, the dash is all nice and original and standard, with everything one would hope to see - the heater with heater tubes, the flyscreens (often missing), the correct wiper motor cover and extinguisher where it should be - all nice to see. 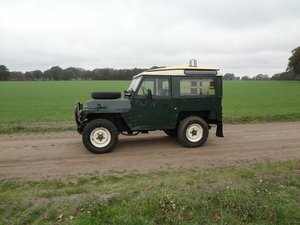 On the outside, this lightweight has good visual appeal, and retains many original features, including military lighting, bonnet mounted spare, military 750 tyres (sound great, look great, fantastic off road, and up gear the vehicle giving the feeling of an overdrive), front lifting eyes, front bumperettes, free wheeling hubs, front towbar, split rear tailgate, bridging plate and under arch toolbox. In summary then, if you are looking for a nice, well sorted lightweight then this could be for you. 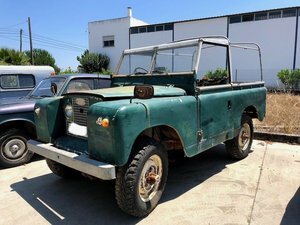 With the prices of these vehicles only climbing and with the benefit of classic insurance, it should prove a solid investment for the future. 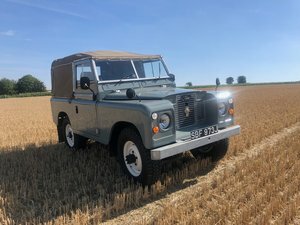 Visit our website for comprehensive photos and a varied stock list of Series 1s, 2s and 3s. We Export Worldwide. 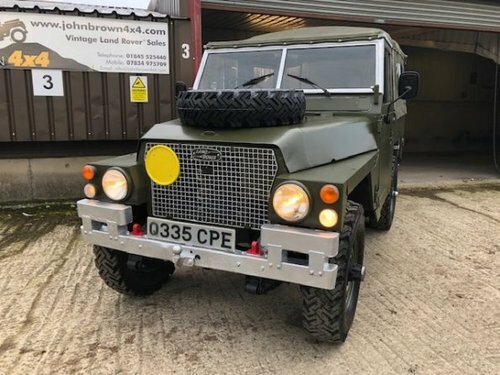 John Brown 4x4 are the Market Leaders in Vintage Land Rover ? Sales.